Talk to us. Your feedback is our most important motivator. Post a problem in the SolutionExchange for the Showhow2 community to answer. Your Context sensitive Guide will play you a Guide Showletdepending upon the section of the interface you are using at themoment. The features and Showlets that helps you to troubleshoot some of the most common problems. The most useful features that lets you get started and also get the most out of your gadget. Smart users Start here. What you want might be on the hot list. Check it out here before you start searching! How to add new phone number to existing contact. How to add new custom field to a contact. How to turn off the pulsing notification light. How to turn on the pulsing notification light. How to reject an incoming call with a custom reply message. Register to view the full transcript. Use this slider to increase the font size for your comfortable reading. 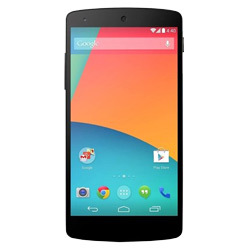 Smart, stylish and sleek is the black LG Google Nexus 5 GSM mobile phone. Powered by the latest and newest Android v4.4 Kitkat OS, enjoy the performance and a whole lot of new features. Explore more, save more, easily and quickly, as the phone offers you 16 GB memory space. Click pictures, make videos with the 8 MP Optical Image Stabiliser (OIS) camera with HDR+ and save them in the phone, itself. Relive your beautiful picture memories on the 5 inch full HD IPS display. Take pictures, access applications and surf the web at lightning fast speed as the mobile phone comes with 2.26 GHz, Snapdragon 800 Quad Core processor and 2 GB RAM. Enjoy the many benefits of the built-in sensors that come in this phone. It features Ambient Light, Digital Compass, Accelerometer, Gyroscope and Proximity sensor. With this LG Google Nexus 5 you get many connectivity and networking options. It comes with 2G, 3G, 4G, GPRS, EDGE, Wi-Fi 802.11 a/b/g/n, Bluetooth v4.0, USB v2.0 + HS, Wi-Fi Direct, NFC and DLNA. Chat, surf the web, share data and a lot more, comfortably and conveniently, with this smart phone. Equipped with powerful 2300 mAh Li-Po battery, once you completely charge this phone in the morning, work on it comfortably through the day. You can get up to 17 hours talk time, and up to 300 hours standby time on 3G network. You can find the comparison between Google Nexus 5 vs Samsung Galaxy S4. To find the reviews for Lg nexus 5 you can click on this link. Here you will find the link for your Lg Nexus 5 and you can find the all relevant details to it. Did you find this video useful?